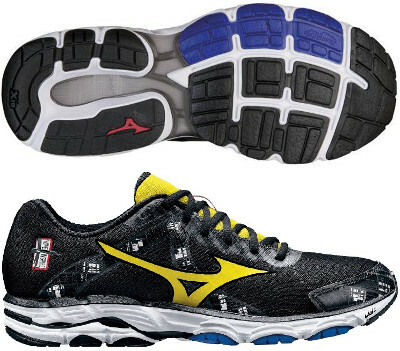 Mizuno Wave Inspire 10 are stability cushioned running shoes. One might think that the Mizuno Wave Inspire 10 could be the overpronator version of the popular Wave Rider 17, but although lighter than its rivals, actually it is a more solid one. It follows the silent revolution started by the Wave Sayonara based on the new midsole compound U4ic which performs like old AP+ but it is 30% lighter. It features a smooth transition providing correction from heel combining new cushioning material SR Touch with well known Wave® technology in the heel to dissipate impact forces away when landing, offering a more reactive response. Toe box is now wider at midfoot for improved comfort. It uses a seamless lightweight mesh (AIRmesh) with great breathability and thermosealed elements to reduce overlays following minimalist trend. Internal fastening strips (Dynamotion Fit) help guiding foot and improve fit. Outsole has been redesigned from what was present in its predecessor the Wave Inspire 9 to provide a softer feel without changing durability thanks to enduring X-10 carbon rubber is used in high impact areas for improved traction.